The man really does have henchmen in the most Hollywood sense. You know, the talentless sycophants that the diabolical characters in every plot seem to attract, who end up causing more problems than they solve? Yeah, that's our boy Harper's pals. Can you even begin to imagine what they'd do if they had competent people? How much of their time is spent trying to mitigate damage caused by the off-script actions of their own? I'm gonna take a wild guess and suggest that the new fighter report is somewhat less than totally and utterly enthusiastic about the flying rainbow of awesome that the F-35 is supposed to be. The Cons simply don't like providing the public information about things that make them look bad, poor things. A quick thought: Canada's ancient fleet of CF-18s have undergone upgrades to their weapons systems, radar, avionics, and communications suites that bring them up to par with their NATO peers. They are presently being [re]deployed to Europe under tense conditions in order mitigate against militarily aggressive moves by THE peer competitor. If Canada's Hornets are so deficient, do you think they would be deployed under conditions that could see them pitted against the latest generation of Russian fighters and air defences? Fun fact: Modern fighter and attack aircraft capabilities are partly products of flyability, and considerably more products of their weapons and sensor kit and pilot training, which is why RCAF CF-18s remain deployable as frontline combat aircraft. The critical problems with the F-35 is that it suffers airframe and sensor issues that require fixes because the technology in these things is simply not mature. The so-called 4th generation fighters are technologically mature, proven, designs where the major faults have been identified and rectified. They are also upgradable to keep up with sensors and weapons technology changes, like our CF-18s. Outside of low-speed turn and burn Battle of Britain style dogfights where agility and available energy matter a lot, the sensors and weapons are what make the difference. Dogfights are rare and risky, and air forces will try to win them before they start through missile kills at extended range. Best thing Canada could do if it thinks it needs a combat air force is to quit faffing and pick a proven airframe (even two!) and stick with it and let the RCAF evolve around it, as it has always done to acceptable effect (e.g. CF-101, CF-104, CF-5, CF-18). Mr. Biden, Mr. Obama, Mr. Putin, and the assorted malcontents running about hunting rags and mismatched surplus NATO camo uniforms, where do you think this all leads? Absolute worst case, Russia and the US/NATO get into a shooting war over Ukraine. Even if it doesn't go nuclear, you can bet it means the rubblisation of Ukraine and maybe a NATO and Russian base or two, a fracked global economy, and a whole lot of dead people. If it goes hot, the useless idiots running around in Ukraine waving various flags and assault rifles will all be maimed or dead by Christmas. They have no idea what they're doing. There's no win there. Just a long, ugly, deadly, fight. So now that NATO is rediscovering why it exists and squaring off against Putin's Russia, and RCAF is redeploying CF-18s to the Soviet Russian frontier in Europe, does anyone wanna argue for why the still-undeployable F-35 is the best warplane out there? 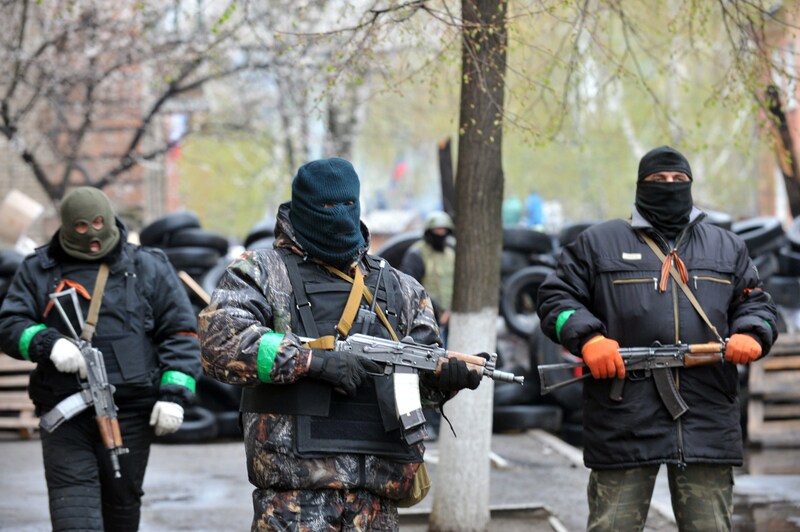 Back to the Ukraine, the media is still reporting Russian troops in Eastern Ukraine as "pro-Russian activists". There are pro-Russian activists in the east, and they look like this, or like this. Note the mix-n-match clothing, with some hunting-type camouflage, civilian jackets, etc. None of them are carrying any visible webbing or magazine pouches, the only visible ammunition they carry are two taped-together rifle magazings. Their AK-74s are older model, worn, with wooden furniture. They are also portly and many of the photos we've seen show a mix of men of all ages and fitness. The crowd of characters below are uniform in all aspects of dress, equipment, and weapons, with AK-74s of the same pattern seen on actual Russian troops in Crimea. 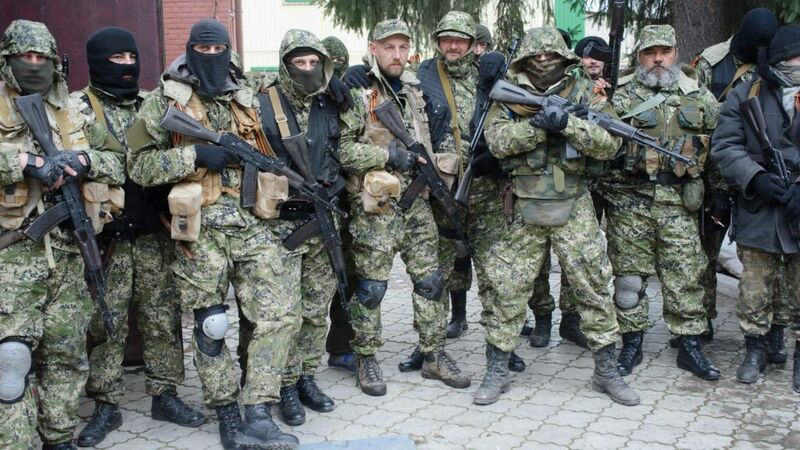 The subtle differences in dress, such as beards and soft-caps, and the sensitivity of the mission in Ukraine suggest these are commandos of some sort. In other photos some are carrying disposable anti-tank rockets. The point is that there is a Russian military presence in unannexed Ukraine, and NATO/Western leaders are exactly right when they say it's unfolding much like the annexation of Crimea was. It is probably very likely that Russia is in the process of annexing a large piece of Ukraine, perhaps gambling that the West and the new Kiev government will do anything to avoid full-on war with Russia. First, Ukraine couldn't survive such an engagement without US/European military support. US/Euro support eventually means arms, which in turn puts it in a very direct military confrontation with Russia, in Europe and not safely away in some far-flung former colony. This is a very dangerous gamble because the fear behind it isn't so much Europe's (and global, price wise) dependence on the availability of Russian oil and gas, but the fact of Russian nuclear weapons. Now, progressive peers will point to the West, Obama, and so on as myopic blame for events in the Ukraine, based on perceived motives behind NATO expansion. Whatever the merit to these arguments (and I think some border on paranoia), they pose no solution. This kind of assessment conveniently ignores the fact that Russia is militarily annexing a neighbouring state, taking advantage of internal political weakness, which it had a good hand in sowing through its support of Ukraine's former leader. If we're quick to condemn the US for Iraq and Afghanistan, it's just as bad when Russia does likewise. The realist in me says Russia can have Crimea, but if it does not withdraw its forces from eastern Ukraine, that country is on a path to civil war, which the Russians will effectively win if the West does not step in. If Russia's goal is to annex as much of Ukraine as it can, then anything it says otherwise at high-level international meetings that indicates otherwise is a delaying tactic. IF this is the case, we have an incredibly serious problem. We are 25 years from the end of the first Cold War. That's enough time for an entirely new generation of diplomants, thinkers, and military/intellegence people to come of age, and associated institutional culture changes and memory losses on all sides. Once again, rearward facing views rooted in notions of cultural or ethnic purity that attempt to redress the past eventually lead to very ugly places.